The private Dragon space capsule launched by SpaceX on Friday (March 1) is chasing the International Space Station, giving stargazers in the Southern Hemisphere a chance to spot the two spacecraft in the nighttime sky tonight. 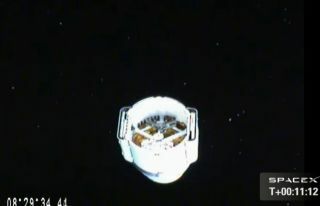 SpaceX's unmanned Dragon capsule was slated to arrive at the space station early today (March 2), but a thruster glitch on the spacecraft (which has since been fixed) delayed that plan to no earlier than Sunday, extending the spacecraft sighting opportunities for stargazers. When the two spacecraft finally meet, the space station's robotic arm will grapple Dragon and attach it a connecting port. Both spacecraft will then appear as a single bright moving "star," weather permitting. But while the two vehicles remain separated from each other, it will give ground observers an opportunity to watch the SpaceX Dragon capsule and the International Space Station visible as separate entities, appearing as moving lights sailing across the twilight sky. Across the Southern Hemisphere, however, the two space vehicles will be readily accessible depending on the location, either in the evening sky soon after sunset or in the morning sky just before sunrise. The space station makes one full orbit of the Earth every 92.8 minutes at an average altitude of 259 miles (417 kilometers). As of early Saturday morning, Dragon led the space station by about 7 minutes and traveling in an orbit roughly 8 miles (12 km) lower than the station. By Saturday evening and Sunday morning (March 3), Dragon will lead the station by just one to three minutes. That means that it might be possible to see both space vehicles in the sky at the same time. Dragon will appear first, followed a minute or three later by the Dragon capsule traveling along basically the same path. Because of its size and the configuration of its highly reflective solar panels, the 430-ton space station is by far the brightest man-made object currently in orbit around Earth. On favorable passes, it can shine so bright that it rivals the planet Venus in brilliance, making the orbiting lab more than 25 times more luminous than Sirius, the brightest star in the night sky. Some have even caught a glimpse of the International Space Station just prior to sunset or shortly after sunrise. And as a bonus, sunlight glinting directly off the solar panels can sometimes make the space appear to flare briefly to super-brilliance. The SpaceX Dragon capsule, on the other hand, is much smaller than the station, measuring about 14.4 feet tall (4.4 meters) and 12 feet in diameter (3.7 m). With its solar panels fully extended, however, the vehicle measures 54 feet wide (16.5 m). Another great site is the Real Time Satellite Tracking website, which shows you at any given moment during the day or night over what part of Earth Dragon or the space station happen to be. SpaceX launched the Dragon spacecraft Friday atop the company's Falcon 9 rocket to deliver 1,200 pounds (544 kilograms) of cargo and its support equipment to the International Space Station. The mission is SpaceX's third flight to the space station and the second of 12 cargo delivery runs by SpaceX under a $1.6 billion contract with NASA. Editor's Note: If you take a great photo of SpaceX's Dragon capsule and the International Space Station, or any other night sky object that you'd like to share for a possible story or image gallery, send photos, comments and your name and location to managing editor Tariq Malik at spacephotos@space.com. Joe Rao serves as an instructor and guest lecturer at New York's Hayden Planetarium. He writes about astronomy for The New York Times and other publications, and he is also an on-camera meteorologist for News 12 Westchester, New York. This article was first published on SPACE.com.